As announced by the Government of Ontario in late February, the Ministry of Natural Resources and Forestry (MNRF) has been reviewing the Far North Act with a view to reducing red tape and restrictions on important economic development projects in the Far North of Ontario, including the Ring of Fire, all-season roads and electrical transmission projects for communities. As part of the review, the Ministry is proposing to repeal the Far North Act. If a decision is made to repeal the Far North Act, the MNRF is proposing to continue joint-planning with: Marten Falls, Webequie, Eabametoong, Mishkeegogamang, Constance Lake, Deer Lake and McDowell Lake First Nations with conclusion of planning by the end of 2020. As a participant on the Minister’s Far North Advisory Panel that provided input and advice to the development of the legislation, the Ontario Waterpower Association (OWA) is keenly aware of the leadership of First Nations in advancing economic opportunity. 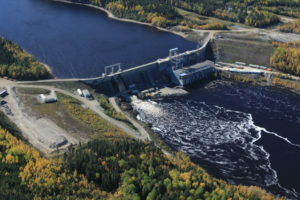 Unique to waterpower is the fact that all development in the region must be led by or be in partnership with First Nations through the provisions of provincial policy dating back to 1993. It is not a question of whether First Nations will lead development but how, where and when. For a number of years, the OWA has been working directly with Far North First Nations to support their interest in waterpower. 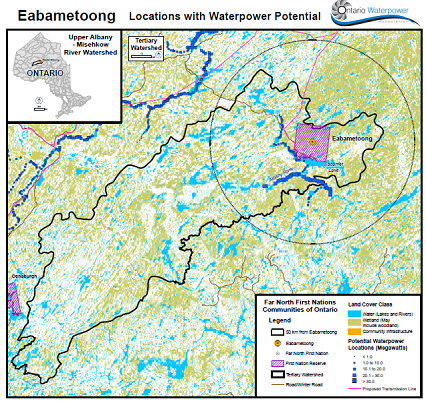 In 2013, in partnership with the MNRF, Independent Electricity System Operator (IESO), and the Ministry of Energy, the OWA commissioned Hatch to evaluate and assess economic waterpower potential through three (3) lenses: large hydro north of the Lower Mattagami complex in the Moose River Basin; waterpower in proximity to the Ring of Fire; and small hydro near to diesel dependent remote communities. In all three (3) cases, the significant untapped potential of economic waterpower was affirmed. Figure 1: The OWA will continue to support the interests of those communities pursuing joint planning. So, what do the proposed changes to the legislative framework in the Far North mean for waterpower? In short, the prohibition on advancing a waterpower project in the absence of a completed land use plan will be removed – potentially enabling communities with an interest in development to proceed. For those communities pursuing joint planning, the OWA will continue to support their interests through the provision of data and information (Figure 1). And with the government’s commitment to advancing transmission and development in the Ring of Fire, coincident realization of waterpower potential is made possible. But it is perhaps the significant participation of Indigenous communities in waterpower projects in Northern Ontario over the last decade that will be the real driver for the realization of waterpower potential in the Far North. In the northeast, the gateway to the Moose River Basin, partnerships on the Mattagami, French and the Kapuskasing Rivers and at Newpost Creek have each established frameworks for additional investments. In the northwest, developments on the White and Namewaminikan Rivers and at Ear Falls have increased the capacity of First Nation communities as industry players. And the art of the possible demonstrated by the Wataynikaneyap transmission project signifies real change. Collectively, these partnerships have helped foster Indigenous leadership in waterpower and other economic development – leadership that no doubt will be critical to unlocking the untapped potential of Ontario’s Far North.